Josephine's home on Martnique is located south of Fort de France. Called the Musee de la Pagerie (Pagerie Museum), it sits in a rural area with rolling hills. The plantation's sugar cane fields have long disappeared and the area surrounding the museum is dominated by tall tropical trees. 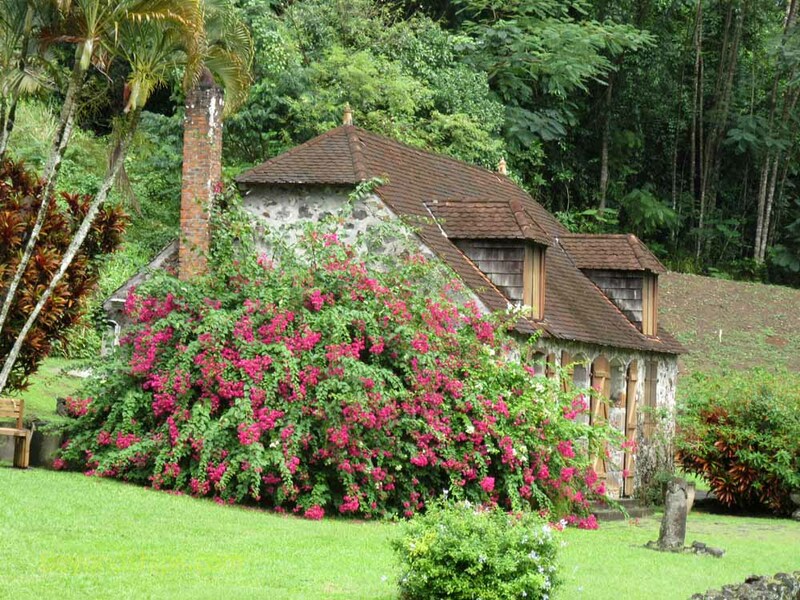 Driving along the access road, you suddenly come to a clearing where the main buildings of the plantation once stood. It is a beautifully landscaped area. 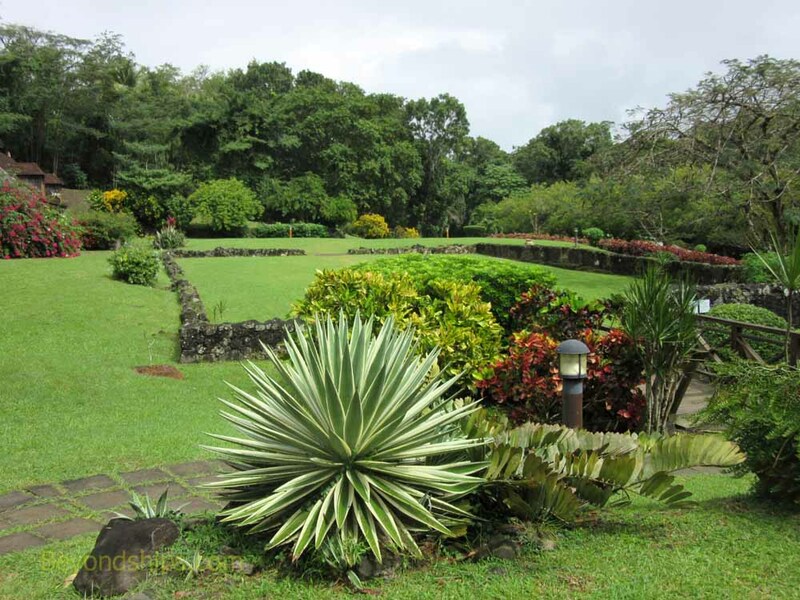 Flowering plants and tropical trees punctuate manicured grass lawns. 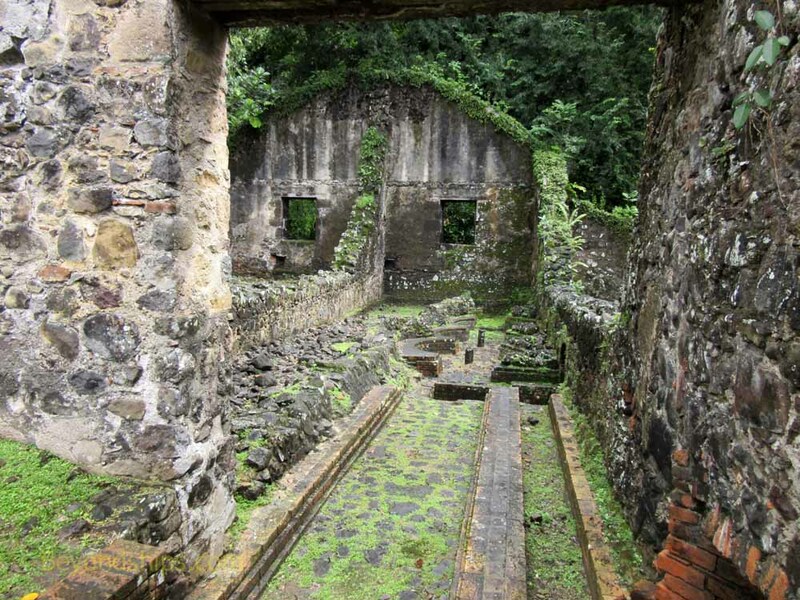 The ruins of the plantation's main buildings give it a haunting, slightly meloncoly atmosphere. Near the small parking lot is a welcome center and a large open-sided pavilion, which protects visitors from the occasional tropical shower while they wait for a guide. 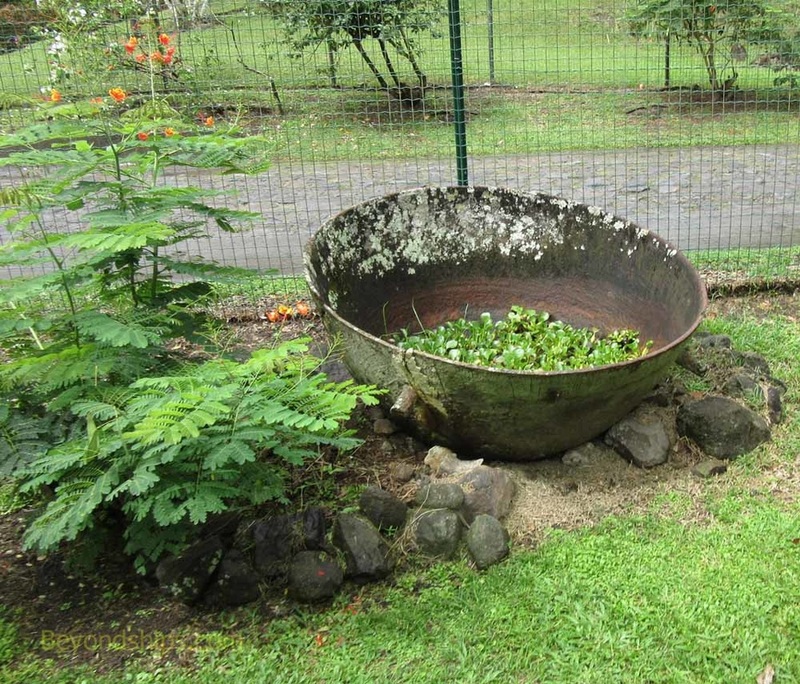 Around the welcome center are various exhibits relating to the history of Martinique. On one of the walls is a painting of a young girl dressing in front of a mirror. Her reflection is that of the jeweled empress. As noted earlier, the main buildings are in ruins. The great house was destoryed by fire before Josephine was born and all that remains is the stone foundation. Judging from the size of the foundation it must have been quite large. Josephine's family lived above the sugar mill, which is across the drive from the great house. A clearly industrial structure, it must have been a completely different environment than the elegant great house. Across the lawn on the far side of the great house is a small builing, which has survived. It was once the kitchen for the great house. In those days, the kitchen was often apart from the main house. One reason was to prevent fires from spreading from the kitchen to the living quarters. Another reason was to keep the heat of the ovens away from the main house. 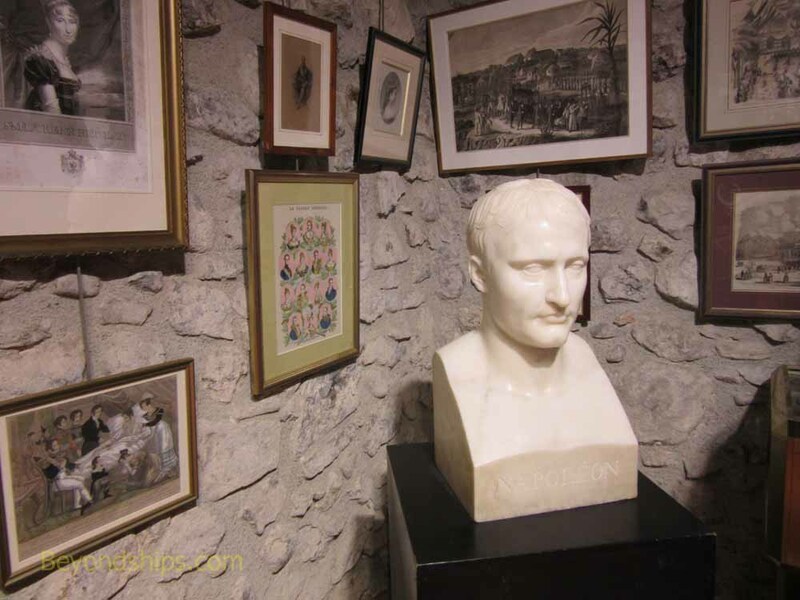 Today, the kitchen house is a museum with exhibits relating to Josephine and the Napoleonic era. There are paintings of the principal figures and some period furniture. The exhibits were not without interest but ae not the chief attraction of this place. Nor are the grounds, which are pretty even on a rainy day. Rather, the attraction lies in the realization that this was the starting point for a jounrey that no one could have imagined when it began. For Josephine to have gone from here to where she ended required the world to change several times in ways that would have been inconceivable to the people who lived here. No writer could have penned such a plot. Above: All that remains of the great house is the foundation. 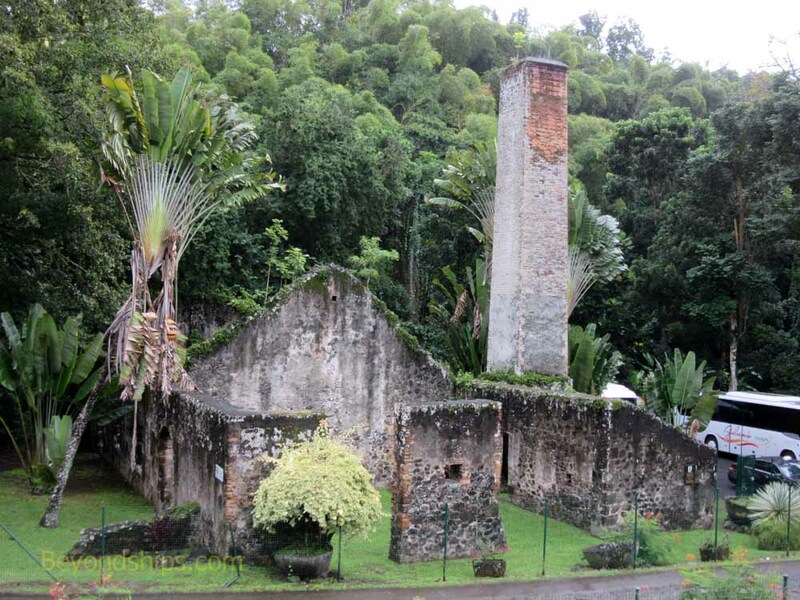 Below: The ruins of the sugar mill where Josephine and her family once lived. Above: Inside the sugar mill. Below: The kitchen building has been restored and houses exhibits.